Expect a mostly cloudy day with below average temperatures across the Rio Grande Valley on Tuesday, according to the National Weather Service in Brownsville. 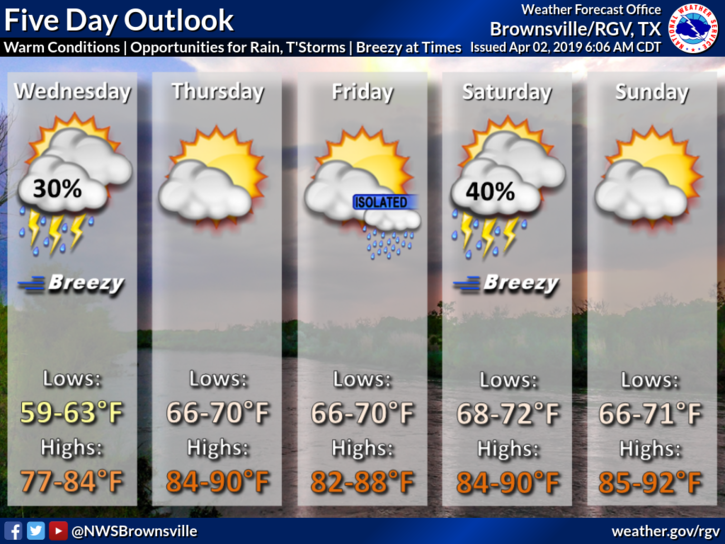 Brownsville will be 70 degrees while McAllen will be 71. South Padre Island will be a few degrees cooler at 67. On Wednesday, there will be a 30 percent chance for thunderstorms. Lows will be between 59 and 63 degrees with highs between 77 and 84 degrees. There is a possibility some areas in the Valley will hit 90 on Thursday as temps move into the 80s for the remainder of the week. There’s a 40 percent chance for thunderstorms on Saturday.